If a business has to taste success in today’s highly competitive times, it has to function with the utmost efficiency and accuracy. This is where they need the association with the subject matter experts. These Experts should be matching the requirements of the goals set in Business Plan. More often we intend to hire experts when we are not able to solve problems with internal resources. The Strategy team of the organisation can do a mapping of Expertise requirements for the achievements of business goals. The Senior management team which needs to give direction for the future may have had good past records but may or may not be able to solve the future unknown needs. There is no harm is doing fair self-introspection to assess the actual needs of the expertise to achieve desired results. A simple but exhaustive process of Expertise requirements can map the type of experts required with timeline and dependency on each other. An engagement process with experts with pre-booking of time slots can help effective execution. However, finding such reliable and trustworthy is not a matter of a Cakewalk. This service provider emerges into the scene in this context to simplify the hassles in this regard. 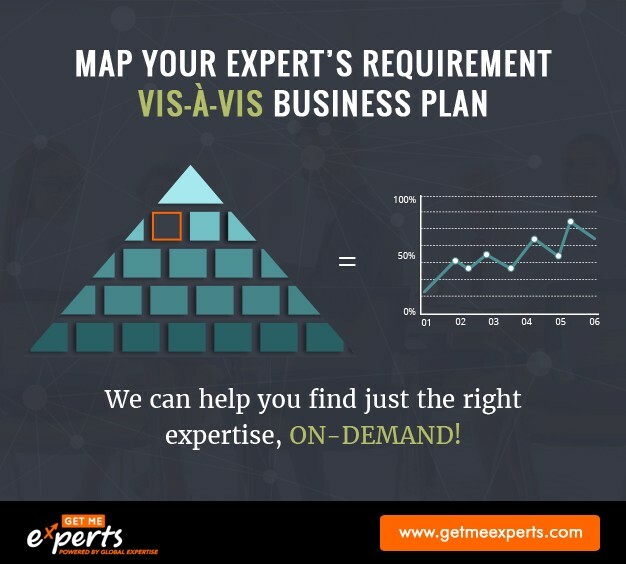 “Get Me Experts” acts as a global platform for companies to find the most expert and experienced professionals who can handle their assignments in various areas of business operations. Thus, it will be right to say that the services of this provider enable businesses to find the masters in business & technology management and thus, induce more efficiency in their business process. Gone are the days when companies used to search Experts/Consultants from there immediate references. now the time has come to search the BEST from the WORLD with Effective LOWER COST and JUST IN TIME. The “Expert on Demand” model helps the organisation to reduce lead time of getting Experts and improve their efficiency. If you want to understand more about “Expert On-Demand” model, Contact us and our team will be very happy to assist you with Expertise Assessment and providing right fitment for your requirements.